TimeZone : Public Forum » Service costs more than watch!? I'm hesitant in theory to buy watches that I could replace just as easily as service: some inexpensive seikos, glycine, Hamilton, orient, etc. And yet I do it anyway. Have you run into this? What did you do? just like anything else in that situation....i throw it out. have only tossed 2 watches in 25 years of collecting but it does happen. both were in the $100-$150 rage new. on the flip side, i currently have a 10 year only Seiko 5 that was $90 new and it's still running fine. i'm under $10/year on this watch and it's only going lower. will have zero regrets and throw it away if/when it does bite the dust. Vintage Citizen, movement quit, sentimental value so I sent it in for service and they quoted me $55. That's cheap! but then I looked more into the details and $55 was for a new movement. For watches in this price range, forget servicing it....just pop in a new engine and call it a day. Fastest complete service you're going to experience, 3 days! In collecting vintage watches it's quite common for the service/repair costs to exceed the purchase price of a watch. That doesn't necessarily mean it exceeds the value of the watch, either monetarily or to a collector. With the vintage pieces I aim to have them serviced when acquired. In fact, most of them need to be serviced when acquired as they generally aren't running well due to lack of servicing or poor repairs, or don't run at all and were acquired as non-runners. Such purchases are entered into understanding this is the way of things. For more modern watches of low to moderate value I will also aim to have them serviced as required at some time. They may need to wait in line, but that's the aim if I desire to keep using them. My father used to wear Timex watches and his theory was that they were cheap enough that when they stopped he tossed them and bought a new one. Personally I haven't been in the position where I needed to make that choice. I had the same happen with Citizen in Dallas. They replaced the movement which included the face on an old Eco Drive, new hands, and a light buff it ended up looking like a new watch. I understand the theme of the post. Bought a Seiko SARG009 and a Hamilton Khaki Field Mechanical both below $500 each and will need to find a place to service them when needed that is super super reasonable. When I was shopping for them my goal was to buy quartz and I did not. I'm not sure if I can post his name or servicing prices here, but with my local watchmaker it's a fraction of what most brands and independent service companies charge. If he can service a Breguet complication, he can service just about anything. I had two good local watchmakers in LA CA, now I am at loss who to trust with high end and complicates watches. As per service cost I have a Russian Pilot chronograph with a inner rotating scale and with a great telemeter scale, some call it flash bang artillery scale, or good for gauging lighting distance. I got it in early 90's at a NAWCC show in Pasadena CA for $90. It would cost $400 to service it, but replacements are about $650 now. Wow. I would only service the watch if it had sentimental value otherwise it be thrown out. I would open up the case back and tinker with the movement or possibly keep it for parts for other watches. 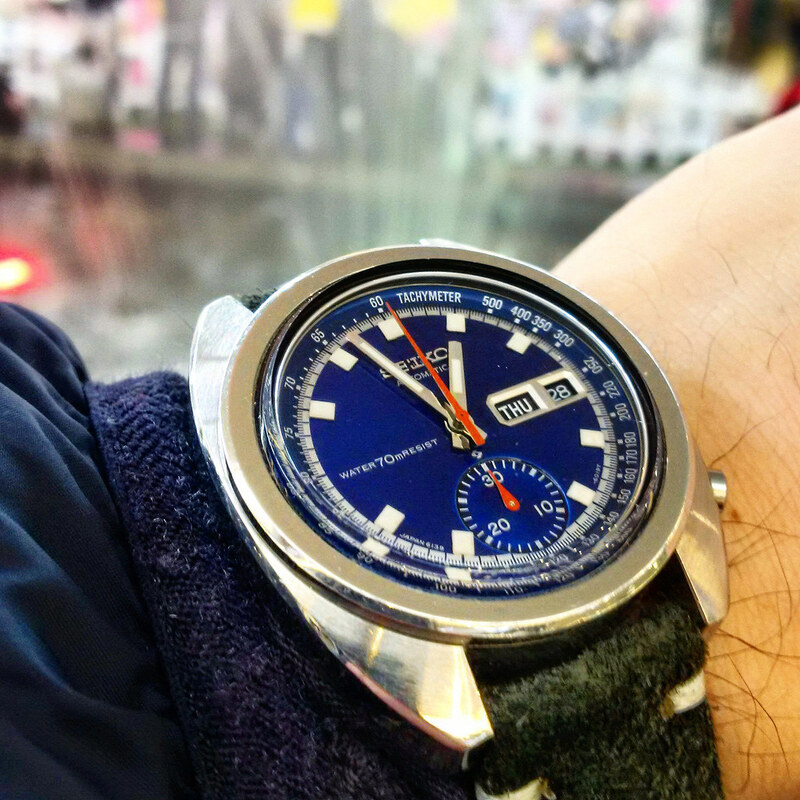 Yup, a beautiful blue dial early Seiko 6139 chrono. It was like NOS. Service cost more than the purchase price. But NO WAY was I going to throw this out. For me, it gives me a perfect excuse to be 5 minutes late. Just kidding...nice watches need servicing, just like home appliances and cars. Gotta do what you gotta do! Next Topic: A mix of modern and vintage pieces--what should be next in the collection?